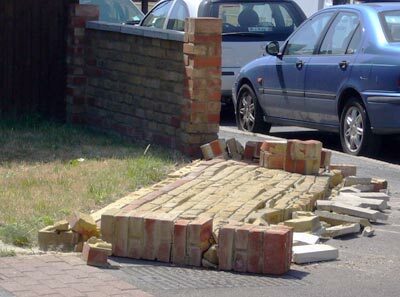 This morning, I saw that a wall down the street had succumbed to its inevitable destiny. I’m no builder, but I’m pretty sure that you aren’t supposed to make a wall like that. The wall had always looked dodgy; in fact, their garden wall on the far side (built by the same cowboys, no doubt) was blown over by the wind some time ago, and is now two residual courses of bricks with a wooden fence on top.